The recent release of Mars Attacks! The Miniatures Game by Mantic Games has been an exciting time for me to say the least. I supported the Kickstarter, and whilst anxiously awaiting the arrival of my pledge, I cracked and decided to purchase an extra starter set. 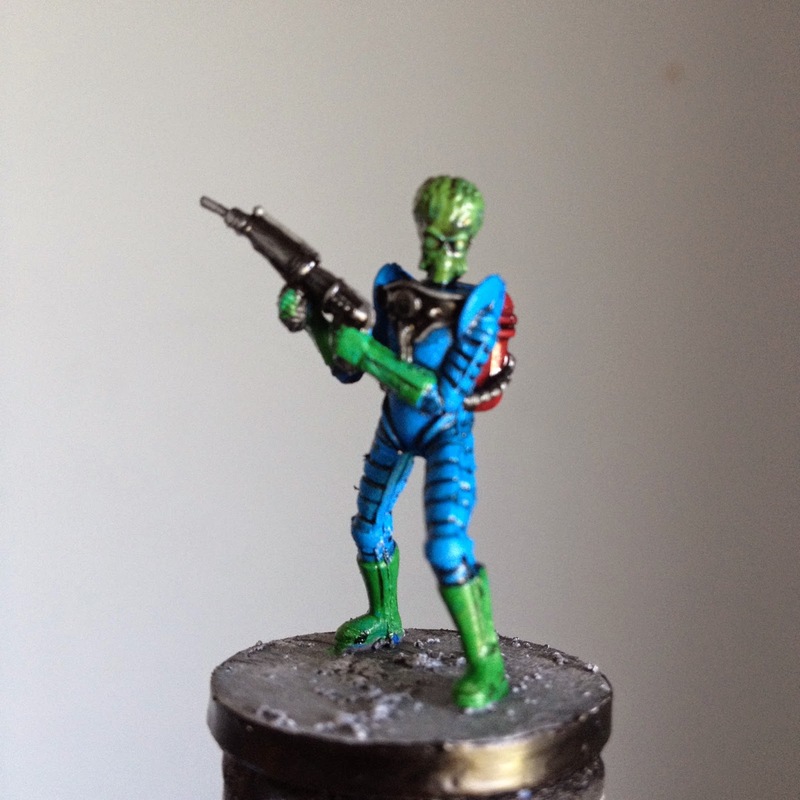 Much to my dismay, I was unable to find a tutorial to painting the Martians in a way that I found visually appealing. 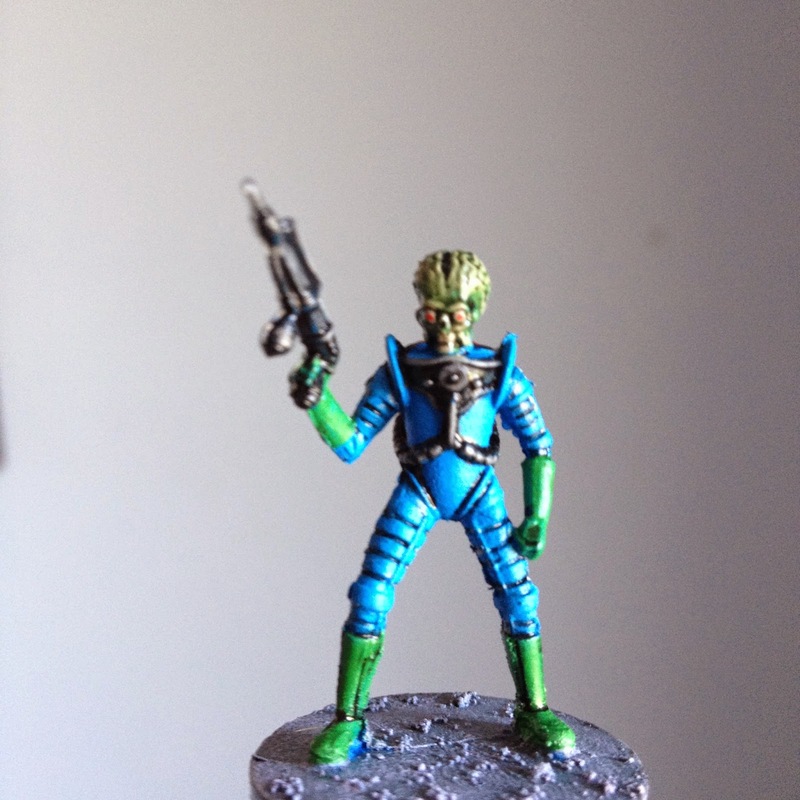 In an effort to help alleviate this issue for other gamers, I've decided to post the techniques that I've used to paint some of my Martians. 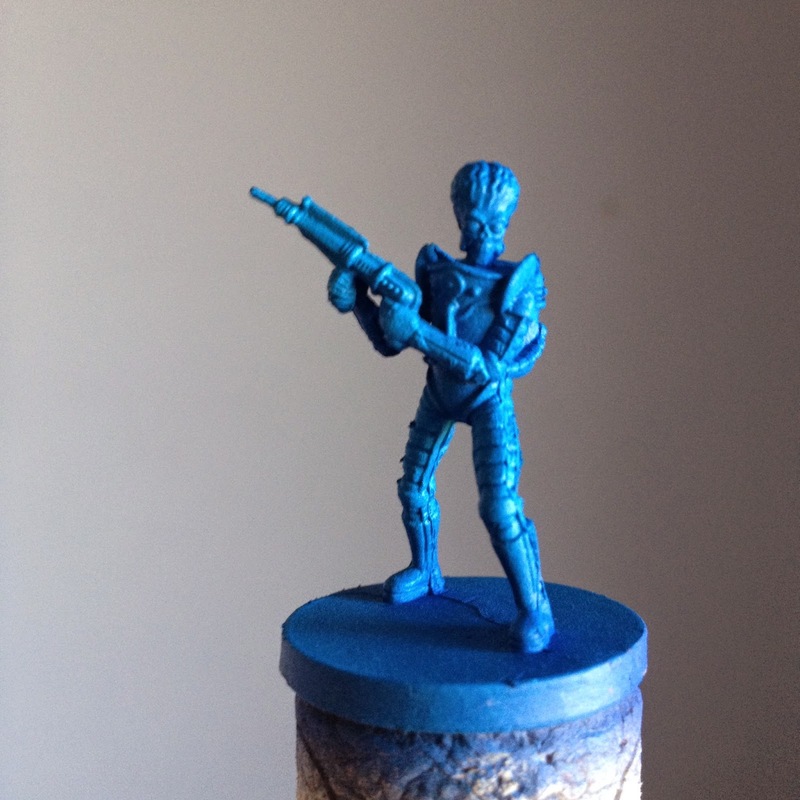 Once I've removed the mold lines from the Martian figure, I primed the miniature with the Ultramarine Surface Primer from the Vallejo Air range applied with an airbrush. It's important to apply this coat evenly and thoroughly over the whole model. When the primer has dried, I applied a layer of Magic Blue also from the Vallejo Game Air range. For this layer I tried to keep the airbrush at a slightly higher angle, so some of the Ultramarine Primer would be visible. This technique creates some easily done shading and acts as a sort of lazy man's zenithal highlighting. After the Magic Blue has dried, I applied a layer of Electric Blue from the Vallejo Game Air Range. Again, I apply it at a higher angle with the airbrush than the previous coats to continue the shading technique. 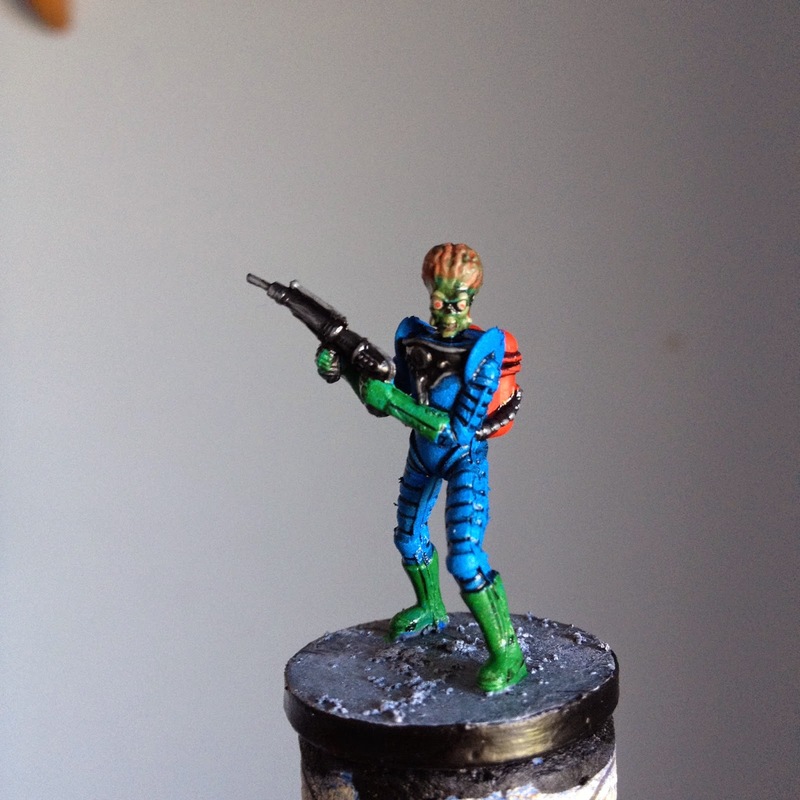 A Martian Grunt at the end of Phase I of painting. After letting the Phase 1 painting thoroughly dry, I began basecoating the other colours. It's important that your paints down at this point. 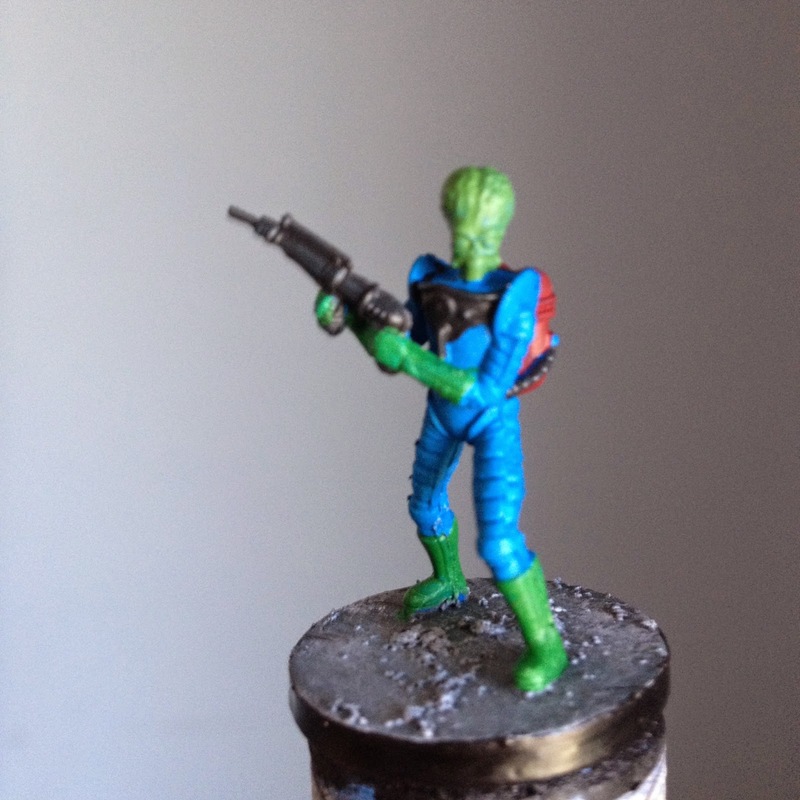 While doing so is common practice for miniatures painting, I emphasize it now as the Mars Attacks! figures have very shallow detail (meaning it would be very easy to accidentally fill in detail if your paint is too thick). I also recommend painting your base prior to painting the boots as doing the reverse will likely make a mess of your invaders' spiffy green footwear (see the picture below for the basing scheme I used). For the metal areas (the disintegration rifle, the chest piece, and the tubes going to the backpack) I used a thinned down 1:1 mix of Citadel's Eshin Grey and Abaddon Black. For the boots and gloves, I used Warpstone Glow while the Martian's head is painted Warboss Green. Finally, I painted the backpack Khorne Red. 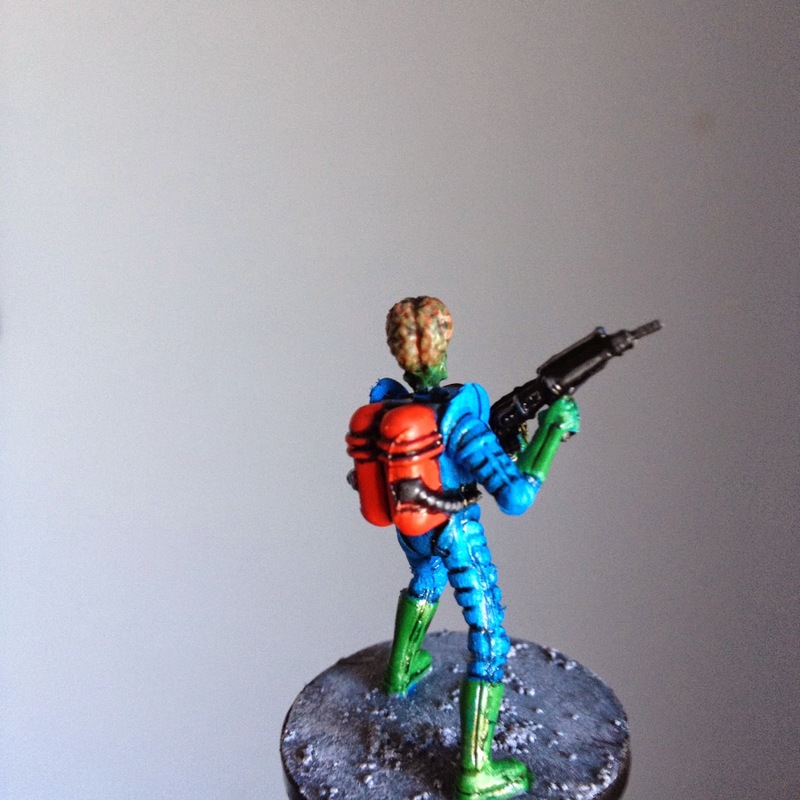 A Martian Grunt at the end of Phase II of painting. I later decided to paint the tube's connection ports the same colour as the tubes. For the bases, I painted the base with the Citadel Astrogranite texture paint, followed by subsequent drybrushed layers of Dawnstone Grey, then Fenrisian Grey, and finally Praxeti White. I then painted the outer ring of the base Abaddon Black. For this step, I began by applying some quick highlights to the areas of the model that were painted with the Eshin Grey/Abaddon Black mix. I highlighted the raised areas with Eshin Grey, followed by a a careful highlight of Dawnstone Grey. Next, I made a 1:1 mix of Nuln Oil (any black wash will do) and acrylic medium (or airbrush medium if you have that available). I then applied the wash ONLY IN THE RECESSES of the blue areas, gloves, and boots. 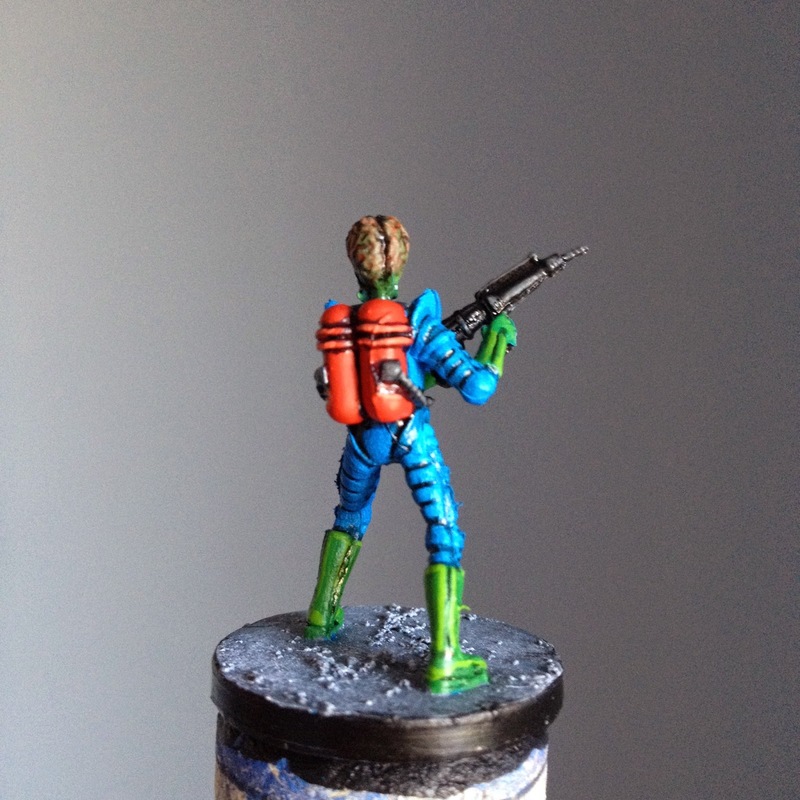 I applied a more generous wash over the head, the grey areas, and the backpack. Excessive wash application may cause your Martians' heads to explode. 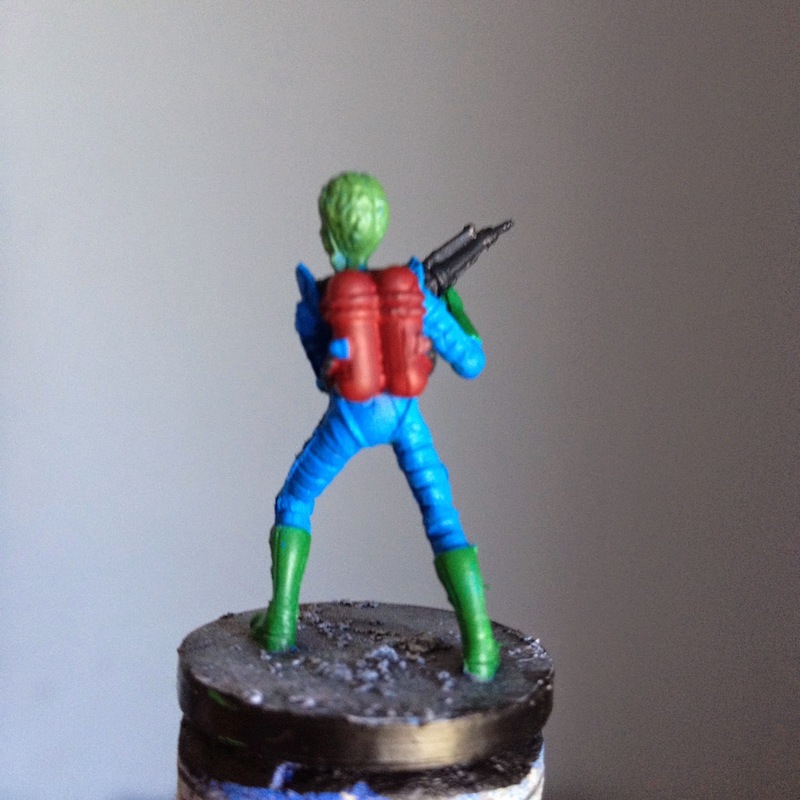 For the next step, I applied a coat of Evil Sunz Scarlet to the Martian's backpack. Be careful to leave the darker areas from previous coats visible. 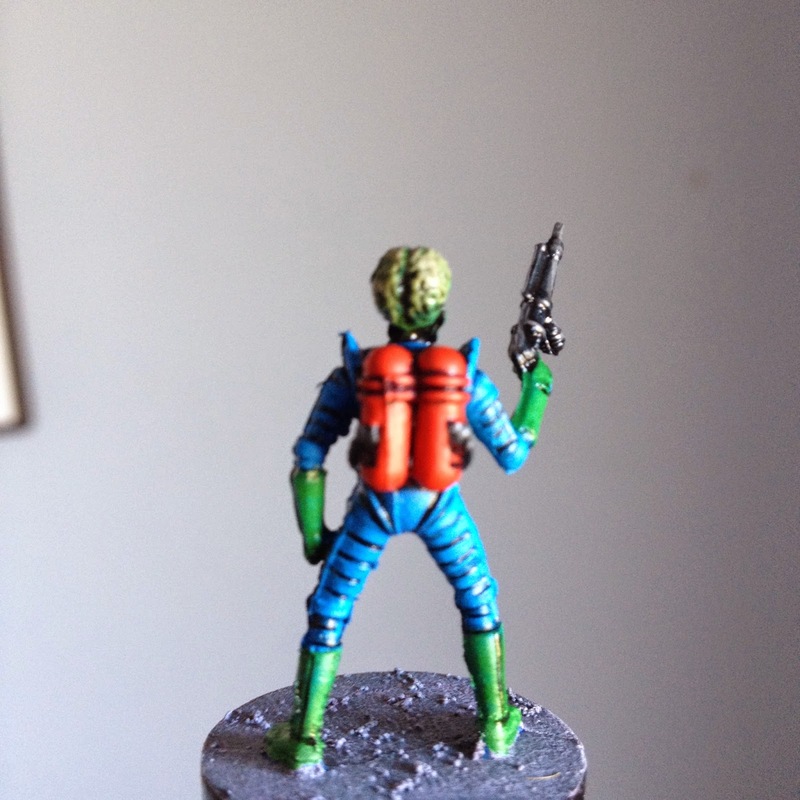 Now the really fun stuff begins with painted the Martian's head and face. 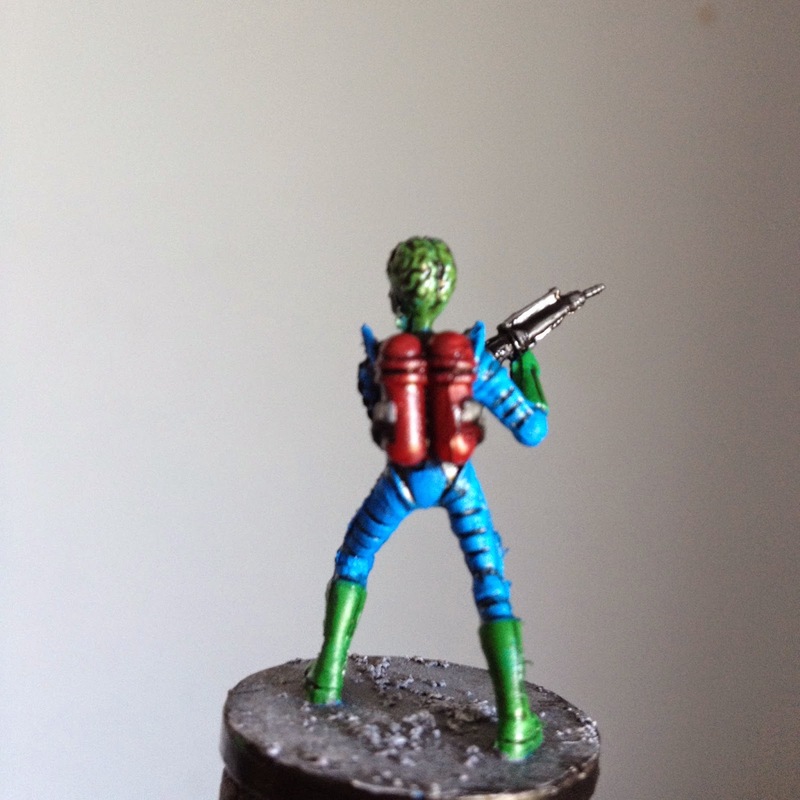 First, I highlighted the entire head with Straken Green, and then highlighted the highest areas with a 1:1 mix of Straken Green and Rakarth Flesh. I then painted the eyes and teeth with Rakarth Flesh. I then carefully pained on pupils with Evil Sunz Scarlet. Adding the colour change from the face to the brain is a quick and easy step, just apply a layer of Bloodletter Glaze to the brain, making sure that none pools in the facial recesses. 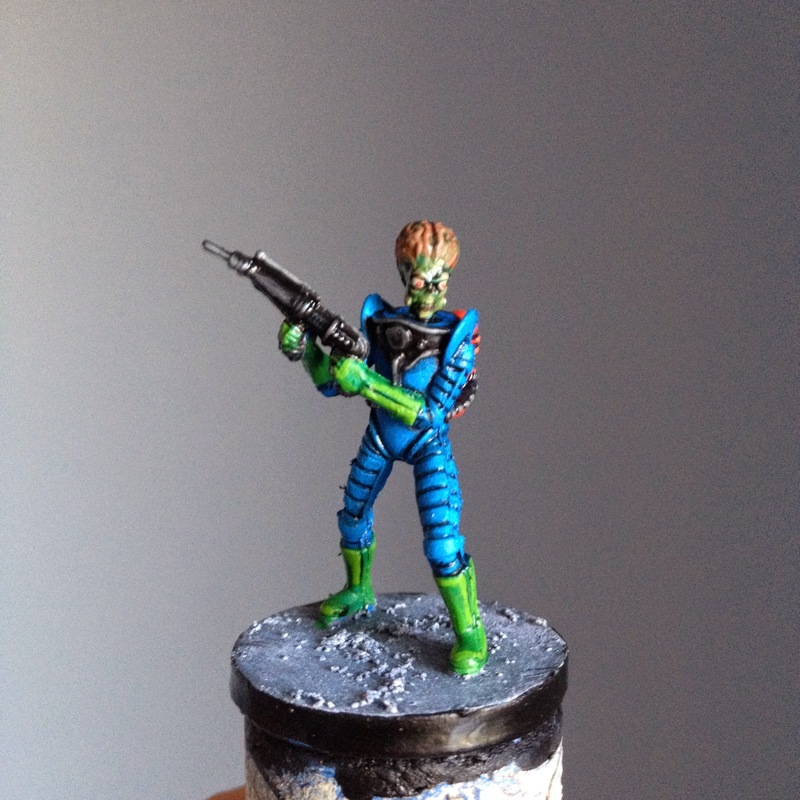 While the glaze was drying, I applied a quick highlight of a 1:1 mix Warpstone Glow and Moot Green to the boots and gloves followed by a highlight of Moot Green. 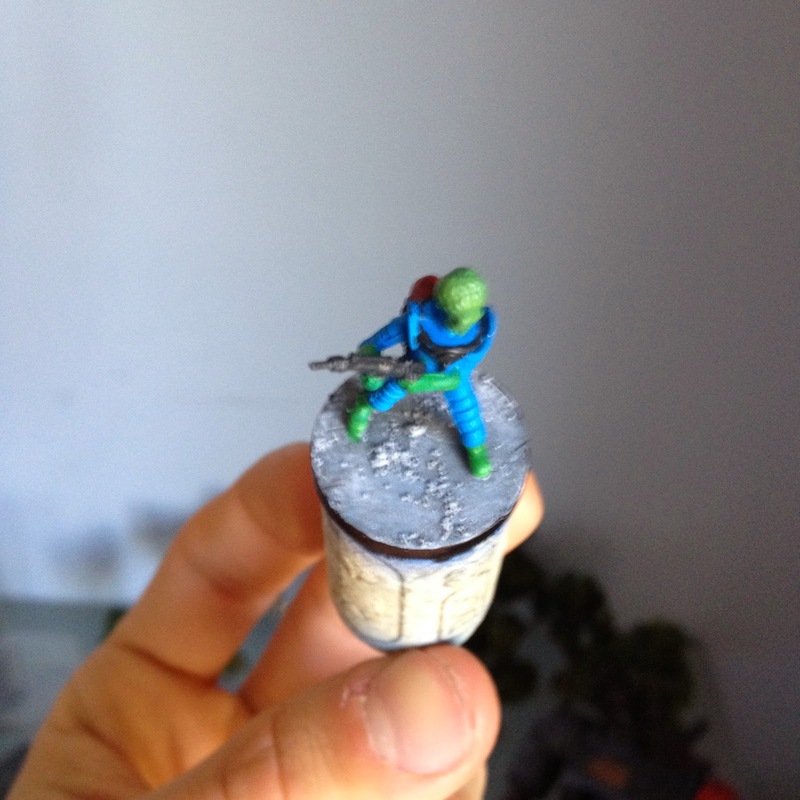 Stay tuned for Part II, where I'll finish off painting the Martian and attach the helmet dome.